Published: March 11, 2013 at 09:19 p.m. Updated: March 12, 2013 at 10:50 a.m. 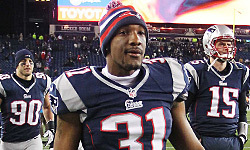 The New England Patriots would like to get a deal done with Aqib Talib before the start of free agency on Tuesday. If that doesn't happen, we now know of at least one team reportedly ready to make a play for the cornerback. USA Today reported Monday that the Washington Redskins have expressed interest in Talib and will attempt to sign him if he makes it to free agency. Talib would be a welcome addition to a Redskins defense that finished 30th against the pass last season. A roster spot already is open after the team officially cut ties with cornerback DeAngelo Hall on Monday. Talib also has personnel ties to Washington. General manager Bruce Allen drafted Talib during his time with the Tampa Bay Buccaneers, while defensive backs coach Raheem Morris was Talib's head coach for three seasons. One thing working in favor of the Patriots is the Redskins' cap situation. Washington still needs to make some moves just to get under the cap before the start of the new league year. Barring some substantial maneuvering, the Redskins will be ill-equipped to engage in any type of bidding war. It was reported earlier Monday that the Patriots were hoping to get a deal done with Talib before free agency, playing the angle that their offer will be better than what Talib could get in a flush cornerback market. If that doesn't work -- and we have our doubts it will -- the Redskins could position themselves as a solid alternative.